Joss Whedon has much to teach his fans, as he unfurls epics of sacrifice and heroism for superheroes and ordinary people. Firefly, like Alien: Resurrection, was his anti-authoritarian dystopia, while Buffy the Vampire Slayer emphasized girl power and individuality in a world of monsters. Dollhouse tackled identity, memory and the soul, reaching from fantasy into philosophy, just as The Cabin in the Woods satirized the nebulous "Greater Good." Now, Agents of S.H.I.E.L.D. and The Avengers explore heroism, teamwork, and personal responsibility. Whedon has independent works too, all explored from the paranormal romance film In Your Eyes to his feminist skits for Equality Now. In comics, such as X-Men, Runaways, Sugarshock, and Buffy, he explores unconventional teams and chosen families. From Angel's quest for faith and redemption in a world of nihilism to the smaller stories of family and friendships in The Office, Glee, Parenthood, and Roseanne, not to mention Much Ado About Nothing, Whedon offers lessons to improve the world and our roles within it. This book compares themes, motifs, and archetypes across all his works, teasing out the common threads and the messages within. 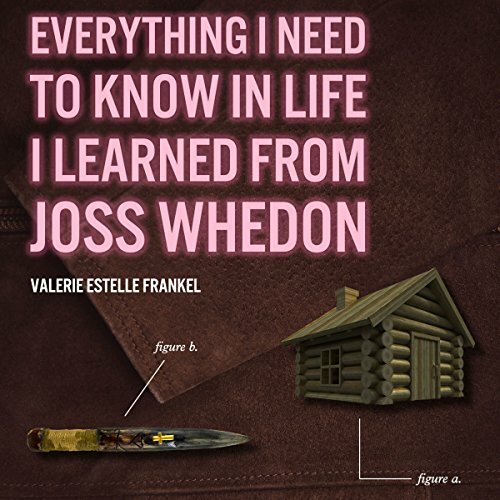 ©2015 Valerie Estelle Frankel (P)2015 Audible, Inc.
A well written look at all of the stories of Joss Whedon. Having watched Buffy and Angel multiple times, and many of Whedon's other stories at least a few times, it was very easy to follow all of the commentary. If I wasn't as familiar with the stories, I think it would have been difficult to follow a lot of what was being described. My only issue with the narrator (and it's minor, but enough to be gratingly annoying each time it happened) is the narrators mispronunciation of names or other things. She reads "Wash" (Firefly) as "Walsh" and Jana (Jenny Calendar-Buffy) with the hard J instead of saying it with the Y sound, and refers to the episode "Band Candy" as "Bad Candy". It's something that a producer well versed in Whedons stories would have caught and fixed. Super interesting. But, fair warning, you need to be very familiar with all of Joss Whedon's works to fully comprehend this book. And it did seem to be pretty repetitive. I feel like a lot of sections could have been combined and the author kept using the same quotes over and over again. But I'm a sucker for anything Whedon, so I had fun.